A tradition of the Lowcountry shines through at the famous Barefoot Resort and the Love Course. As the name implies, Course designer Davis Love III, a native of the Carolinas, incorporates Southern plantation ruins with modern golf. For added challenge, Love has strategically placed the plantation ruins throughout holes 3-7. 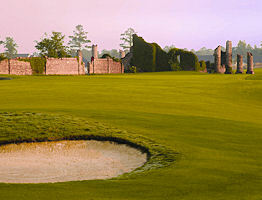 Unforgettable South Carolina golf for all skill sets is played at the Love Course. The Lowcountry course features a striking resemblance to Pinehurst #2 at the 1999 U.S. Open with generous landing areas and green complexes. The Love Course is a par 72 and plays over 7,000 yards. Fairways and tees consist of a GN-1 hybrid turf. The approach areas consist of Tif-sport Bermuda grass, and the greens are Champion UltraDwarf. The Love Course is rated one of the best golf courses on the Grand Strand. While the course is playable by both skilled and beginner golfers, rewarding shots are made at hole 4 a split river design. Why play the Love Course? Many golfers continue to book the Love Course for their golf vacation to experience the unique drop-offs and undulating layouts. Course in excellent condition. Greens receptive and rolling good and true. Fairways and tees awesome shape. Staff are friendly and professional. I would recommend playing here. Really nice golf experience. You cannot beat the service. The course is tough. Greens are in bad condition. Tresmendous golf here. One of Myrtle Beach's best. Great course! Challenging and rewarding at the same time! Fantastic staff and really well maintained! Would definitely play this course again!! A tradition of the Lowcountry shines through at the famous Barefoot Resort and the Love Course.